A new simple tool developed by nanoengineers at the UC San Diego is opening the door to an era when anyone will be able to build sensors, anywhere, including physicians in the clinic, patients in their home and soldiers in the field. The team developed high-tech bio-inks that react with several chemicals, including glucose. They filled off-the-shelf ballpoint pens with the inks and were able to draw sensors to measure glucose directly on the skin and sensors to measure pollution on leaves. Skin and leaves aren’t the only media on which the pens could be used. Researchers envision sensors drawn directly on smart phones for personalized and inexpensive health monitoring or on external building walls for monitoring of toxic gas pollutants. The sensors also could be used on the battlefield to detect explosives and nerve agents. The study is published in the journal Advanced Healthcare Materials. The team state that the new biocatalytic pen technology, based on novel enzymatic inks, holds considerable promise for a broad range of applications on site and in the field. The biggest challenge the researchers faced was making inks from chemicals and biochemicals that aren’t harmful to humans or plants; could function as the sensors’ electrodes; and retain their properties over long periods in storage and in various conditions. Researchers turned to biocompatible polyethylene glycol, which is used in several drug delivery applications, as a binder. To make the inks conductive to electric current they used graphite powder. 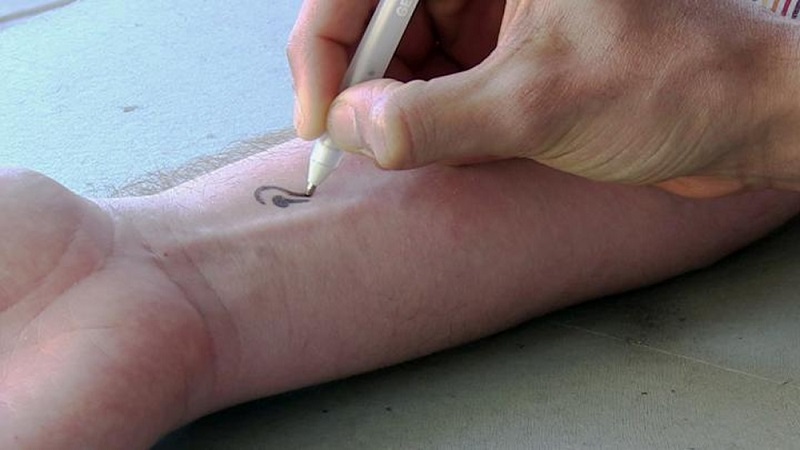 They also added chitosan, an antibacterial agent which is used in bandages to reduce bleeding, to make sure the ink adhered to any surfaces it was used on. The inks’ recipe also includes xylitol, a sugar substitute, which helps stabilize enzymes that react with several chemicals the do-it-yourself sensors are designed to monitor. The team has been investigating how to make glucose testing for diabetics easier for several years. The researchers recently developed non-invasive glucose sensors in the form of temporary tattoos. In this study, they used pens, loaded with an ink that reacts to glucose, to draw reusable glucose-measuring sensors on a pattern printed on a transparent, flexible material which includes an electrode. The researchers then pricked a subject’s finger and put the blood sample on the sensor. The enzymatic ink reacted with glucose and the electrode recorded the measurement, which was transmitted to a glucose-measuring device. Researchers then wiped the pattern clean and drew on it again to take another measurement after the subject had eaten. The researchers estimate that one pen contains enough ink to draw the equivalent of 500 high-fidelity glucose sensor strips. The team also demonstrated that the sensors could be drawn directly on the skin and that they could communicate with a Bluetooth-enabled electronic device that controls electrodes called a potentiostat, to gather data. The pens would also allow users to draw sensors that detect pollutants and potentially harmful chemicals sensors on the spot. This was demonstrated in the current study by drawing a sensor on a leaf with an ink loaded with enzymes that react with phenol, an industrial chemical, which can also be found in cosmetics, including sunscreen. The leaf was then dipped in a solution of water and phenol and the sensor was connected to a pollution detector. The sensors could be modified to react with many pollutants, including heavy metals or pesticides. The team state that the next steps include connecting the sensors wirelessly to monitoring devices and investigating how the sensors perform in difficult conditions, including extreme temperatures, varying humidity and extended exposure to sunlight. The sensors also work directly on the skin to, for example, detect glucose. Pens Filled with High-Tech Inks for Do It Yourself Sensors. Credit: UC San Diego.